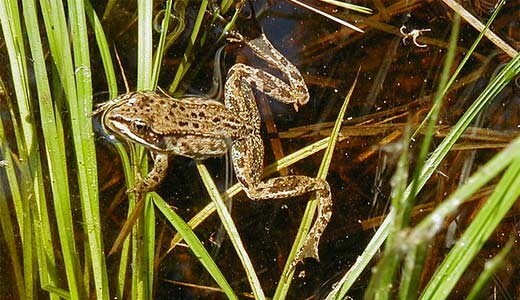 The highly aquatic Columbia Spotted Frog can only live near permanent water bodies. Habitat destruction and modification is causing population declines in some parts of its range. The Columbia Spotted Frog is highly aquatic and can only live near permanent water bodies. Adults eat insects, molluscs, crustaceans, spiders and even other amphibians. Larvae eat algae and organic debris. Typical of adult frogs, the Columbia Spotted Frog has a long sticky tongue which it flings out at high speed to capture prey. During breeding season, males attract females with a series of low-volume clicks or knocking sounds. The frogs also produce a shrieking alarm call when they are attacked by predators. Although this species is widespread, habitat destruction and modification, e.g. via cattle grazing and water diversion, is causing population declines in some parts of its range. Climate change is a further threat as it is decreasing the availability of permanent water bodies which the frogs rely on. Climate change is also facilitating the spread of the deadly chytrid fungus Batrachochytrium dendrobatidis, which has decimated amphibian populations worldwide.